A while back I stumbled upon something called “tube quilting”. I think it’s generally meant to be a technique to get blocks that look something like string blocks — with a lot less sewing — but the first thing that popped into my head was a potentially quick way to make half square triangles (HSTs). Always wanting to try something new, I used this technique to make my first mug rug. And for posterity, or publicity, or maybe just cuz I love my camera, I took pictures of the process. So the general idea is to create a “tube” of fabric from two strips sewn down each side as shown below. I probably should have taken a shot of both sides, but youse guys are smart and I’m sure can figure it out on your own. The other tutorials I’ve seen want you to buy a special cutting ruler called the “strip tube” ruler. 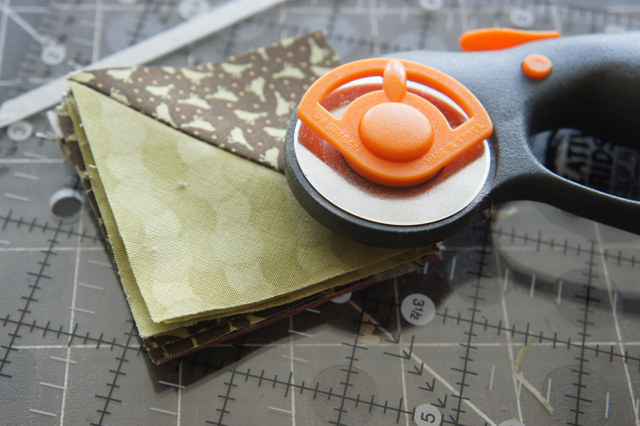 As if every quilter has unlimited funds lying around to drop another $20 on a ruler. What is with that anyway? A piece of plexiglass with some markings on it and the quilting companies think they can charge us an arm and a leg… Yeah, I always wait until they’re on sale at JoAnn… or I just use a weekly 40% off coupon for JoAnn. But anyway, I really only have two. The one shown and another one for something that I can’t remember. Once again, I digress. So rather than buy the expensive “special” strip-tube ruler, I figured out what size I wanted my finished triangles, and used the pythagorean theorem (yes, math!) to figure out how wide to make my strips. 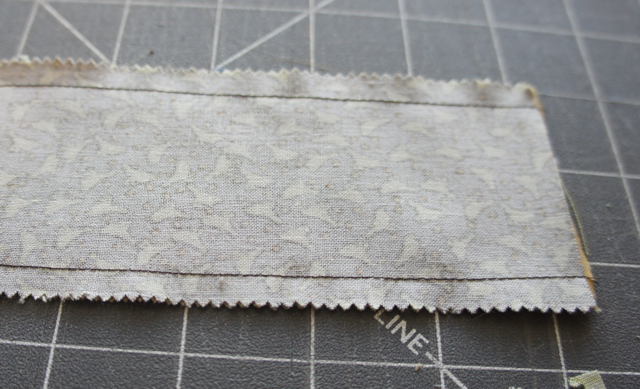 Ok, not really… I just used two strips from a jelly roll and sewed them together…. but you could use the pythagorean theorem if you were so inclined…. 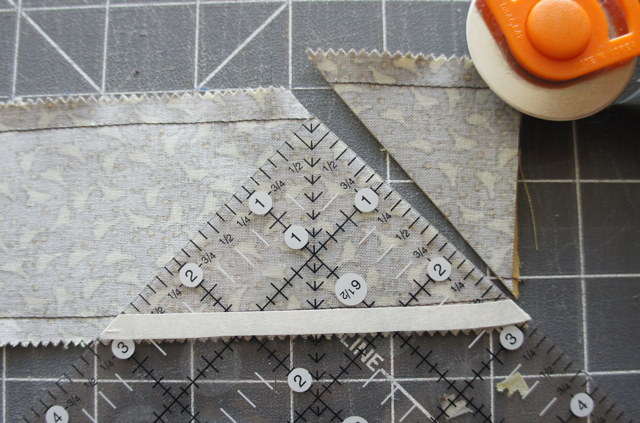 After I sewed the strips together, I just plopped my square ruler down with the point on one seam, then I added a strip of tape to mark the straight edge where the other seam lies. This isn’t strictly necessary, but it made lining the ruler up super fast. 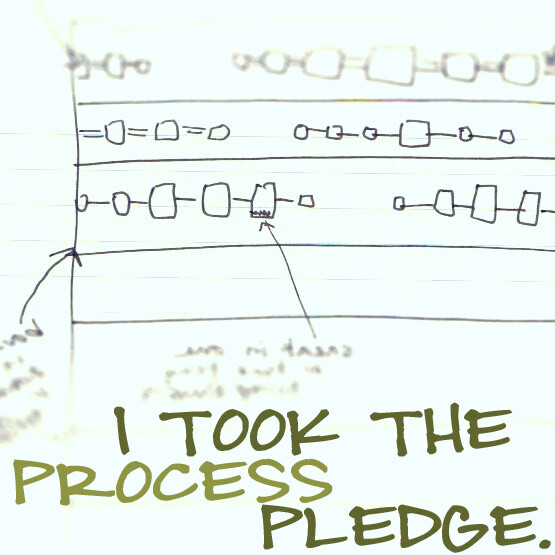 Now, take a deep breath and make the first cut. That piece you cut off is scrap. 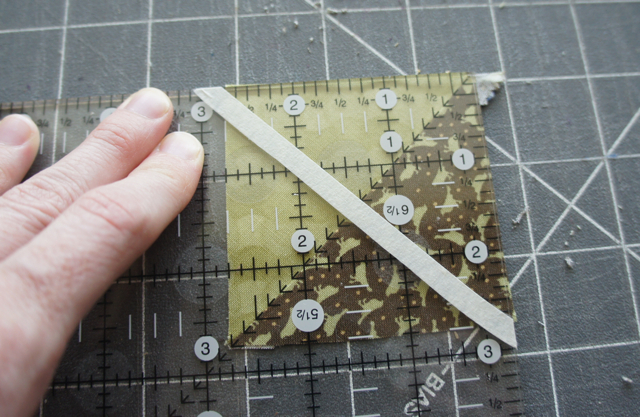 Flip the ruler upside down and match the tape marker up with the other seam, and one edge with the already cut edge and make another cut. Now you have another HST! 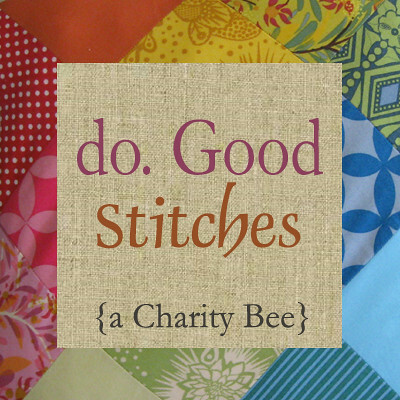 Keep going until you get to the end of your tube, or have as many HSTs as you need. Press the blocks and you are done! Now, the real story. I’m not sure I would use this technique for HSTs again. I’m rather impatient, and flipping the ruler back and forth 80-jillion times got old fast. Not to mention I couldn’t really find a comfortable position to cut without also flipping the fabric back and forth. I also wasn’t wild about having my triangles cut on the bias. It makes sewing them together a bit more of a headache. There was also a good bit of waste, since both end pieces are an entire 1/2 block in themselves. I suppose you could minimize that waste by placing your blocks en pointe. 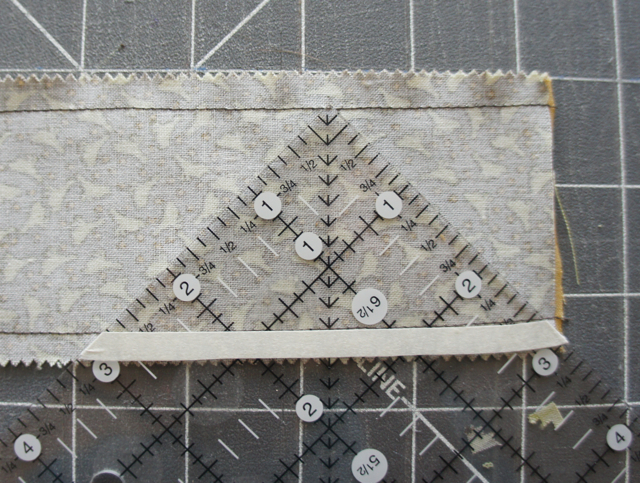 OTOH, if I was going to make a LOT of string type blocks, I could see how tube quilting could be useful. All in all, it was a neat experiment. Maybe others will have better luck. If you try this out, let me know, I’d be interested in seeing your results! I went to a quilt show today and saw someone demonstrate this tube triangle technique and I said to myself, there’s got to be cheaper way. I came home, Googled tube triangles and viola!! Found you. I saw this technique recently in a book, and it’s good to see it demonstrated. They used it to make squares where one of the triangles was composed of 3 strips. So it was like half a string block and half triangle. In that case it might be worth the work. I’m like you…thinking why do I need to spend more $$ on something else! I DO have a WonderCut ruler. Since I’m Math challenged, it does do the math for me (has lines that tell you the width of your strips) but I never could figure out why somebody re-invented the wheel. You don’t actually have to flip the ruler over every time. 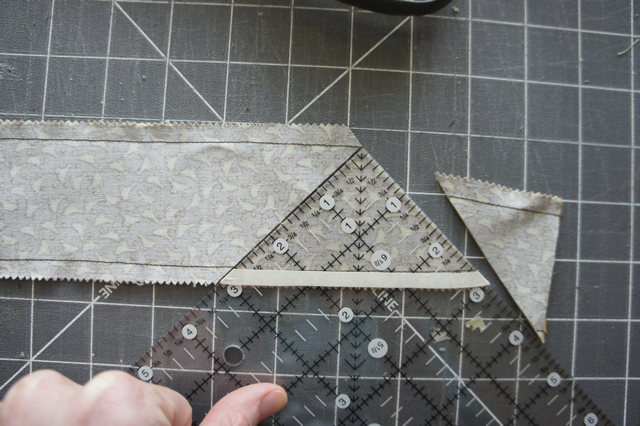 You can move it over and line it up, leaving the opposite HST and cut the next one that would be on the same side, just cut past the point to cut all the way to the opposite edge of the fabric and you would cut two opposite side HSTs at once. I hope I’m explaining this so it makes sense. 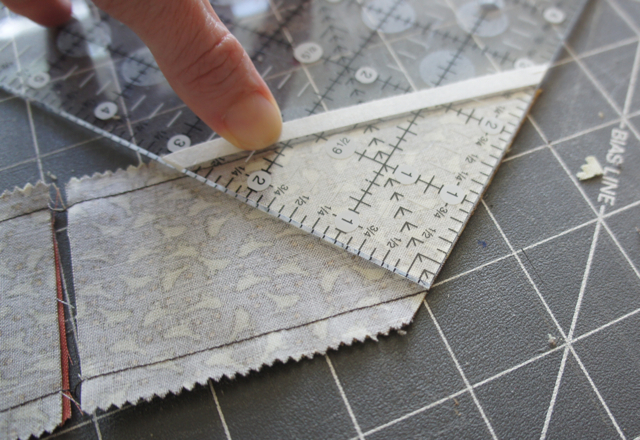 It takes a little practice to make sure you get it just right but it’s much easier and faster than flipping the ruler and fabric every cut. Thanks for showing the actual cutting using the strip method. It made it a little easier to figure things out. I just found you by way of a QCA member who is hostessing a HST swap, this morning we were discussing the fact that I am making my 240 HST swap pieces the tube method. So Roxana sent me the link to see your units. I am with you as far as rulers go I too have a zillion just ‘hanging’ around. I do however so love my EX companion angle ruler it is a 45 degree ruler used to make the geese inside the wing made with the EZ angle. Old school, these rulers have been available since the rotary cutter arrived on the scene. I laughed at some of your digressing as you can rad I do as well.. digress that is… ty for showing Roxana the process. I have math worked out if you ever need to make a bunch of one size. The units for the swap comprised of 2 fabrics cut 2.25″ strip sewn into the tube then cut tip to seam allowance make a finished 2.5″ HST. I don’t know if I will ever use this technique, but I found your post extremely funny! Thanks! 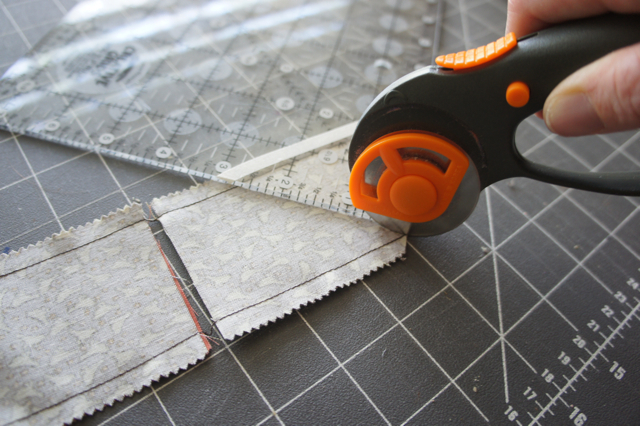 I make my HSTs by cutting a large square out of both of my fabrics, put right sides together then sew all around the perimeter. Cut the sewn squares on both diagonals and Whoomp There It Is, you have 4 HSTs. Wow… thank you very much… my regret is finding your tutorial to late…. des gestes surs et precis.